It’s December now, and we’re really close to the world premiere of who we are in the dark next year. Peggy has completed choreographing for our seven fantastic dancers; and composers/musicians Sarah Neufeld and Jeremy Gara have completed their original score. In this series of ultra-sneak peeks at this incredible new work, we’ve taken four short excerpts from the latest archival video, and asked Peggy to comment on the movement and the music in each one. The final step before our debut with Canadian Stage at the Bluma Appel on February 21 is a 6-day residency at the Betty Oliphant Theatre, where we’ll incorporate all of the design elements into the show: the set drops by John Heward, projections by Jeremy Mimnagh, costumes by Robyn Macdonald and lighting by Marc Parent. All the details for performances of who we are in the dark in Toronto and on tour across Canada in February, March, and April 2019 are here on our website. 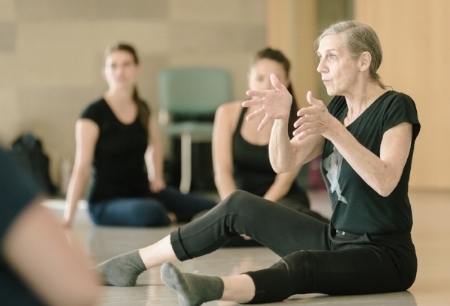 As a masterful dance educator, Peggy Baker invests deeply in the on-going practice of dance pedagogy and in artists honing their craft. 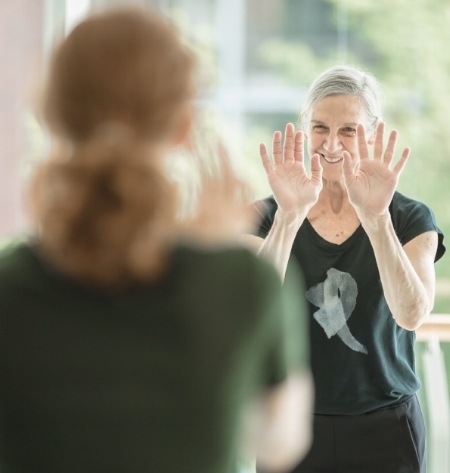 With her upcoming annual Dance Educators' Seminar (August 7 - 10, 2018), and August Intensive (August 13 - 17, 2018), we asked her a few questions about what participants can expect. Can you tell us a little about what you enjoy about the Dance Educators’ Seminar? And the August Intensive? I love the wide open exchange with colleagues during the Dance Educators’ Seminar – the refreshing stimulation of new materials, approaches, and points of view around working with students at different stages of training. It is also exceptional to have technique classes designed for practitioners who are primarily teachers rather than active dancers – classes that work with a high level of nuanced and sophisticated information, and well-considered physical demands. The August Intensive attracts a wide range of dancers concerned with expanding their physical and expressive capabilities. The mix of backgrounds and objectives creates an exciting context for coming together. What sort of needs are you addressing when you develop the curriculum with the invited faculty? Dance is in a constant state of evolution but fundamentally the underlying concerns are: how to develop capability and expertise; how to prepare for and recover from the extraordinary demands of class, rehearsal, performance; how to expand and deepen our artistry as teachers, performers, creators. What kind of personal development do you see happen with participants in these programs? Whenever we apply ourselves with awareness, intensity and a sense of purpose we make good progress. That’s why intensive workshops are so powerful – we all set aside the time and invest the energy. What are you looking forward to about this year’s programs and your classes? I am especially excited to have Sylvain Lafortune teaching partnering at both workshops this summer. A great dance artist, a masterful teacher, his approach is singular, and highly refined through many years of exploration and development, including a doctoral thesis on partnering. I look forward to Jennifer Bolt’s presentations on student transitions into and throughout high demand / high intensity pre-professional training as part of the Dance Educators’ Seminar. It is always a huge pleasure to welcome participants to the gorgeous studios of Canada’s National Ballet School, and to be able to offer classes by Christine Wright, and to work alongside dancers from my company. Are there any tips or advice you would share with anyone who is interested in either program? Don’t be afraid to jump in! There is a huge diversity in age and training among the participants, and the breadth of approaches is what makes these workshops so exciting and powerful. The Dance Educators' Seminar (Aug 7 - 10, 2018) offers 4 full-days of workshops for dance educators. The August Intensive (Aug 13 - 17, 2018) offers full stream, workshop, or drop-in options. Caroline is curating a beautiful costume exhibit at The Theatre Centre as part of Map by Years from Feb 21-25. I first met Peggy Baker when she arrived to the stage of the Betty Oliphant Theatre for a rehearsal with a group of ballet students. I remember that day in the fall of 1989 as though it were yesterday; fast forward a few decades and now we are engaged in a project aptly entitled Map by Years. That first meeting marked the beginning of an important collaboration that saw the fashioning of many one-of-a-kind costumes created for Ms. Baker over the arc of her 20 year solo career. Peggy in Brute. Costume by Jane Townsend. Photo by Lois Greenfield. vivian reiss. Peggy, 2001. oil on canvas. Ms. Baker has always had a deep respect and appreciation for her collaborators, and the costume designers are no exception. Now, as she maps the years with a beautiful array of dance, she has chosen to offer a retrospective of some of the singular works through some of their designers: Susan Macpherson, Denis Lavoie, Jane Townsend and myself, Caroline O’Brien. During the 2018 performance at the Theatre Centre a spotlight will shine on some of the exquisite one of a kind costumes created for Ms. Baker, installed in the spacious second floor gallery that leads directly into the performance space. Peggy in Strand. Costume by Caroline O'Brien. Photo By V. Tony Hauser. The main narrative of the exhibition uses dressmakers’ stands to show finished costumes on display, as a way to emphasize the comprehensive design process with stages in the birth of each costume according to the style of each designer. It follows a number of pieces from inception and initial design through cutting, sewing and after life. This opportunity to showcase a collaborative process through different designers will include renderings, photographs, and archival documentation in addition to the garments themselves. Peggy in Non Coupable. COstume by Susan Macpherson. Photo By Cylla Von Tiedemann. Peggy in In a Landscape. Costume by Jane Townsend. Photo by Cylla Von Tiedemann. The intent of the exhibition is to offer elements of a creative process and the craft and making aspects that are often withheld from the audience’s purview. It will offer new perspectives on the development and construction of singular and traditional dressmaking techniques and the skills required to fashion them, through the work of several designers. Using a combination of visual and prose narratives, the exhibition is intended to deepen and broaden the viewer’s understanding of the creative and technical aspects of creating dance costumes. The objects on view illustrate a valuable contribution to Canadian theatrical dance history. Map by Years is running at The Theatre Centre Feb 21-25. Get your tickets here.